Company: FAMUR Group – a well-known producer and supplier of machinery and equipment applied in extractive industries. The company itself has over one hundred years of experience in providing solutions by executing orders for different customers worldwide. The group, in their sophisticated facilities, develops among other things: longwall systems, roadheading systems, underground and surface transport systems, open-pit mining machines. Industries: Underground and opencast mining, transportation and transhipment, energetics. Project: Preparation of eight mock-up’s of particular devices manufactured by the FAMUR Group with the use of 3D printing. 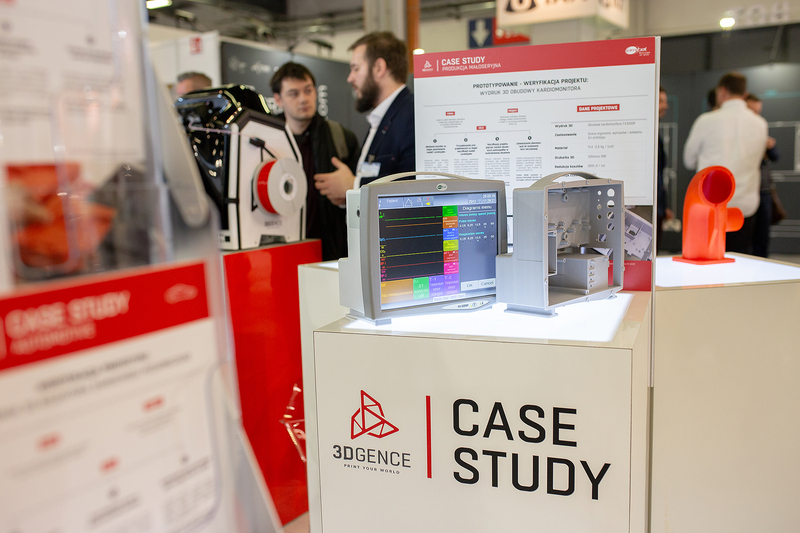 Project’s purpose: Application of 3D printed models as a visualization of company’s portfolio of machinery during The International Fair of Mining, Power Industry and Metallurgy KATOWICE. Realisation: During the fair, the company presented eight different mock-up’s related to particular activities of the group. The mock-up’s were created with the use of 3DGence INDUSTRY F340 and printed in ABS. For the purpose of getting more adequate information about the particular model, the visitors had to place a printed mock-up on the surface of a special console equipped with RFID sensors. After running a computer app., detailed information and technical specification of particular machine started to appear on a screen. Mock-ups of machinery from FAMUR Group realized in 3D printing technology. Thanks to 3D technology printed miniatures of machines, increased interest among our guests at the booth during the fair. Until 2017 the company presented its products traditionally – life-size machines that can weight even several tones were transported to the fairs. Every industry is pursuing new methods to optimize costs and attract new people. FAMUR Group decided to use 3d printing in order to put more emphasis on company promotion by using new technologies. Printed models in combination with a computer application, allow showcasing machinery produced by FAMUR Group to visitors. In addition, thanks to using 3D prints at the booth, the interest of the company was increased. People positively looked at this innovation. Transportation of full-sized machines wasn’t necessary, due to replacement by their own mock-ups. Juxtaposition 3D prints to RFID reader to display machine’s specifications. By using 3DGence INDUSTRY F340 it was possible to print light, solid and precise mock-up’s made of ABS plastic material. Miniature machines of FAMUR Group have been very well copied and thanks to that people visiting the booth had opportunity to see over their all features. The scale was selected individually for each mock-up to allow visitors to manipulate and move models. Using ABS plastic material enabled further processing of the models, which were smoothed and painted. The use of the entire build volume of INDUSTRY F340 allowed minimizing the number of prints. The original design of the heated working chamber guaranteed durable and defect-free prints. We wanted the models not to be too heavy, it was important to have a possibility to easily move them. Printed 3D models as a modern form of product presentation – possibility to combine 3D prints with their own multimedia specification. No need to transport life-size machines – multiple uses of 3Dmodels at different industry fairs. Durability and reliability of 3D models, despite their light weight. Costs saving associated with printing of product’s catalogue due to the combination of 3D print with an RFID reader to display the machines’ specifications. Mock-up of FR 250 roadheader from FAMUR Group created by 3DGence. 3D prints from 3DGence have met our expectation. Find out more about 3D printing services, go to Faktoria3D and see what other projects we can realize. Meet the 3DGence INDUSTRY F340 printer, we will help you to materialize your idea.